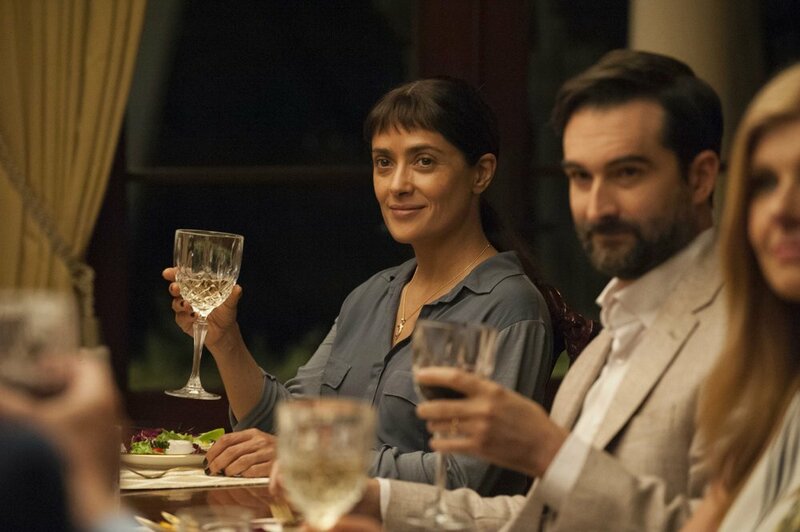 Miguel Arteta’s latest film Beatriz at Dinner, which premiered this past spring at the Sundance Film Festival, captures its audience in a shockingly current portrayal of Trump-era politics as it pervades the private sphere. The film centers on a dinner party gone awry and the subsequent culture war that takes place, giving viewers their first taste of the effects our new political circumstance is creating in Hollywood, particularly for screenwriters. Salma Hayek stars as Beatriz, a Mexican immigrant with a gentle spirit, reverence for nature, and a gift for healing. She works as a masseuse and holistic therapist, helping to ease the pain of cancer patients and other ailing clients. It is through this work that Beatriz meets Cathy (Connie Britton), the wealthy mother of one of Beatriz’s former clients, Tara. Following one of Beatriz’s routine house calls at Cathy’s, her beat-up Volkswagen refuses to start and she is effectively stranded until her mechanic friend can come help her so, Cathy invites her to attend the dinner party she and her husband Grant are hosting. The only problem? The dinner party’s guest of honor is the embodiment of abrasive entitlement and capitalist greed. The man’s name is Doug Strutt (John Lithgow) a real estate developer with a disregard for table manners and a penchant for hunting rhinos. With this oddball pairing, the stage is set and the remainder of the film is devoted to watching Hayek and Lithgow square off as tempers flare and alcohol is poured. This film’s strength lies in the formidable performances by Hayek and Lithgow as well as the supporting players. If you watch this film for any reason, watch it for Hayek’s luminous portrayal of the passionate and spiritual Beatriz. With choppy bangs, natural makeup, and a pair of practical khakis, Hayek is given free rein to explore a role outside of the sexualized Latina typecast. Lithgow also manages to keep Strutt from turning cartoonish even when the dialogue threatens to become too on-the-nose. The biggest problem with the film was its unsatisfying ending. It didn’t flow with the style or tone and was a sharp departure from the rest of the story. That being said, it is a film worth seeing. Beatriz at Dinner offers another entry into the canon of Trump-era films focused on political commentary. It is a film that will not leave you soon and will keep you thinking, and with any hope will show Hollywood how under-utilized Hayek is and give her a chance to broaden her repertoire.